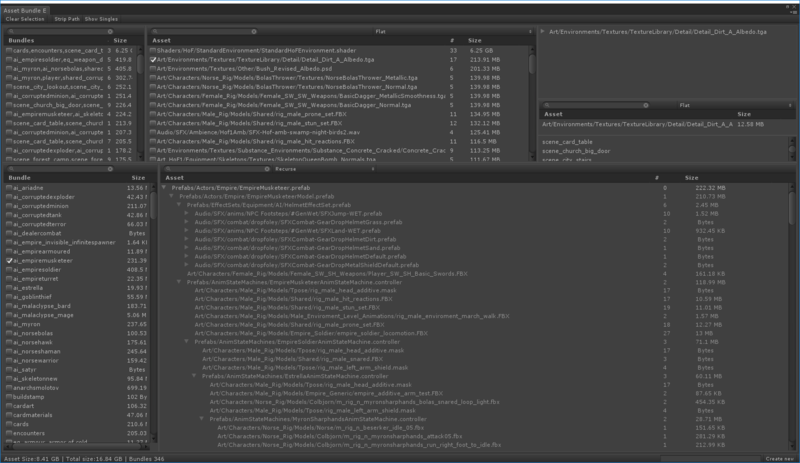 Works like this When we build asset bundles (Custom->Build->Asset Bundles), we parse the build log file for each asset path and how big it is on disk*. We save out a csv file of asset path and byes. On opening the editor window (Custom->Build->Asset Bundle Editor), we iterate all the asset bundles AssetDatabase.GetAllAssetBundleNames() and build a dependency tree by iterating all the asset dependencies. This takes a couple of minutes. When using it, there are 2 modes. Here 5 bundles (ai_empiresoldire,eq_weapon_dualingdaggers…) all reference the same 4 textures and one fbx. Ideally those 4 textures and one fbx will be placed in their own bundle. That will save 4/5 of 419Mb on disk and introduce one seek for each of those bundles. In this case the top right pane shows me all the reverse dependencies of the asset selected, so I can find out how it gets included. Right middle pane shows me the names of the 33 asset bundles that use it.